COMPLETE RESIDENTIAL SERVICE Learn More! QUALITY ROOF MAINTENANCE Learn More! Ace Roofing uses the latest and best products, and backs them with our commitment to excellence. The most trusted roofing contractor in Montana. Newly built or Replacement, you can rely on Ace Roofing to get the job done on time and within budget. Hail damage or just age, Ace Roofing can repair and maintain your flat or sloped roof. Building trust is the first step when hiring a roofing contractor. As a means of introduction to Ace Roofing, please take a few moments to watch these very short videos. It's the first step in building a relationship with us. Our company core values set us apart from the rest and form a foundation for growth. They can be summed up in just five words: 1. Safe 2. Efficient 3. Integrity 4. Professional 5. Respect. our core focus is To provide processes and experiences resulting in loyal employees and customers. 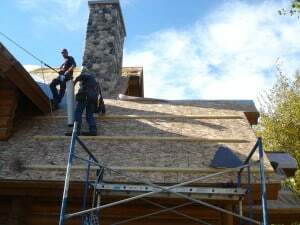 Ace Roofing has become the premier roofing contractor for the Billings, Bozeman, Livingston, and Helena areas. Ace Roofing has been serving Wilsall, MT and the Southwestern region of Montana since 2004. Locally owned and operated. Providing high-quality products with first-class service is not just our motto but our dedicated promise. It is our belief that while it's important to have the highest-quality products competitive pricing it is equally important to be efficient and deliver outstanding and timely result. Our workers strive to work in a safe, professional manner, with thorough clean-up and your home’s roof as our #1 priority. Great follow up and follow through. I appreciate the customer service and the fact that you stuck with the job until it was complete.